OPEN Ealing starts its fundraising for its move to West Ealing with two events this weekend. 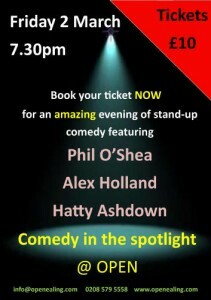 Phil O’Shea – a stand-up comedian who has been performing in Scotland for the last two years and just moved to London. Jon Mapp and Johnny Hereward – OPEN’s own resident musician Johnny Hereward and Jon Mapp play with a selection of musicians who perform regularly at the Castle Inn on Sunday evenings. Do please come along and support OPEN – and there are fantastic raffle prizes on offer including having your portrait painted, your garden designed or a meal at the Star & Anchor. Just noticed that Peacocks has shut down in the high street. Dean on the flower stall said it shut down suddenly on Friday. I know it’s been bought by Edinburgh Woollen Mill and some stores are likely to close down permanently. I hope the West Ealing store is just shut temporarily as it will be a loss to West Ealing let alone to everyone who was working there. Tucked away almost out of sight at the top of the building at 2 St James Ave that backs on to Sainsbury’s is a new gym – Just Add Exercise. I wanted to find out more about it as it’s right at the top of my road and I was curious about its seemingly sudden appearance! I met Matt Hook the owner and he was kind enough to show be round and explain his plans. At its heart is a gym area with a range of equipment from spinning bikes and treadmills to resistance machines with weights plus all sorts of other equipment to get you toned and fit. He offers a personal training service along with nutrition and weight loss advice, sports massage and physiotherapy. Sitting alongside the gym is a 1,000 sq ft area for various exercise classes and, interestingly, drama. For as well as exercise this space hosts The Artists Theatre School on Saturdays when drama classes are run for all age groups. The Artists School was founded by Amanda Redman and classes are given by professional working artists. Matt explained that it the gym is in part of what was once the Primary Care Trust offices above Sainsbury’s but some 3,000 sq ft had become vacant a while back. This is well over twice the space at his previous gym in Ealing Broadway and obviously allowed him to expand his services. It has taken him a while to complete negotiations for this space but even after being open for barely a week it felt well established. Peak gym membership is £18.50 a month and personal training is in addition. There are regular Pilates classes run by Pilates Corps. They offer classes Mondays to Thursdays at a range of times across the day and the classes cost between £8 and £12 depending on how many you book and seniors (which probably now includes me!) get a discount. Five years on and if I do for a moment stop and, as they say, smell the roses, I’d say we’ve made a pretty good start. We helped save some of our traditional lampposts; started the annual Family Day celebration; launched our Abundance project; will soon start a monthly craft market and are within touching distance of helping make the Lido Junction safe to cross. Now though we need to plan for the next five years and that’s where we need your help to answer a vital question: what shall we do with WEN? We need to decide. On Feb 21st we have the fifth AGM and my tenure as Chair, Eric’s as Vice, Andy’s as Treasurer and Gill’s general membership of the committee – well, our time is up. We decided five years ago that we didn’t want WEN to stagnate. So, the question is, what shall we do now? It’s your organisation and it’s a democracy so we all need to decide. No one has so far come forward to hold any of the posts – can we continue as an un-led organisation? I think we are at a crucial moment for West Ealing. We have the major development at Green Man Lane, the forthcoming redevelopment of the Sherwood Close Estate and the possibility of creating a Neighbourhood Forum, under the new Localism Act, to propose a design for central West Ealing (see Eric Leach’s blog of 3rd January 2012 for full details). This is an exciting time for West Ealing and WEN needs to be at the heart of it and helping shape our future and not just letting it be imposed upon us. Here are some of the aspects of WEN that we feel are important but what do you think? At the moment the floor is open wide – do we re-form as something different? Do we each go our separate ways into our different projects? Do we put ourselves into a holding position until we work out what’s best? Or is there someone/some people out there right now longing to lead WEN into the next phase of its life? If you’d like to stand for any of the main officer posts – chair, vice-chair, secretary, treasurer – please let us know before the meeting. Otherwise, please come along, bring your neighbours and let’s talk about our town and ways in which we can make a difference. If you’d like to talk to any members of the committee beforehand, let us know. Please do come along to our Annual General Meeting on Tuesday 21st February at OPEN Ealing starting 7.30pm. Eric Leach, West Ealing Neighbours Vice-Chair, speaks about his experiences with Ealing Council’s on planning issues and how at least one other Council responded to his request for planning information. A reading with SJ Fowler, Christodoulos Makris, Marcus Slease and Cherry Smyth, plus OPEN-mic session. In what we hope will be the first of a regular poetry series at OPEN Ealing, join us for an evening of readings from our guest poets – and yourselves. Everyone is welcome to come along, whether to perform or simply listen. Admission is free. SJ Fowler (www.sjfowlerpoetry.com) is the author of three poetry collections, Red Museum (Knives, Forks and Spoons Press, 2011), Fights (Veer Books, 2011) and Minimum Security Prison Dentistry (AAA, 2011). He is the UK poetry editor of Lyrikline and 3:AM Magazine. He is a full-time employee of the British Museum and a postgraduate student at the Contemporary Centre for Poetic Research, University of London. We held the fourth Joint Action Group meeting today – this note summarises the up to date situation. Since the earlier JAG meetings that started after the incidents in September, there has been considerable activity as we have previously reported. We are now entering the phase where Dean Gardens is being rehabilitated into “day-to-day policing” rather than the “special measures” that we have seen. This does not mean that the Police and Council eyes will be taken off the ball, but rather that we need to use our resources appropriately. The police, council, and charities will continue to work closely together. Patrols will continue to be made around the local retail outlets, off-licences and cafés in the area to ensure that there is minimum temptation – particularly in relation to alcohol consumption. ASBOs will continue to be put to the courts (already a considerable number have been put in front of the courts and more are to follow). These will curtail the known irresponsible troublemakers and the new ones on whom intelligence has been built since the intense joint action programme started. The JAG meetings will continue – but will be held less frequently. 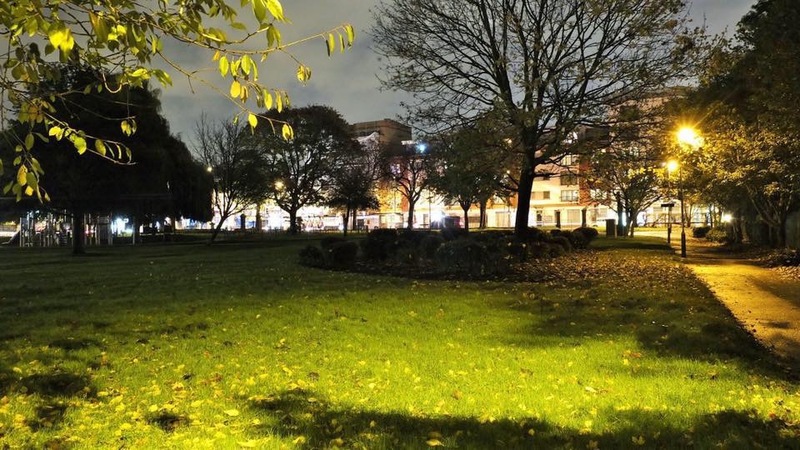 In summary: Dean Gardens is being rehabilitated and is returning to normality as a safer place, day and night, a green space in West Ealing that is a central part of our neighbourhood. As I have said before, of course we cannot guarantee this and therefore as residents we must all continue to watch and help. If you are aware of any anti-social behaviour or drug related incident, you can report it by ringing 101 (this number is for all calls to the police other than emergencies – for which please ring 999). 101 will get you through to the Metropolitan Police who will pass the details to a duty officer in Ealing for collation by our intelligence team. If you have any additional queries, you can contact our local Walpole Police SNT on 020 8721 2949 or email me at patrickchapman@btconnect.com. Oh yes we at WEN Abundance and Ealing Transition are a hardy lot! 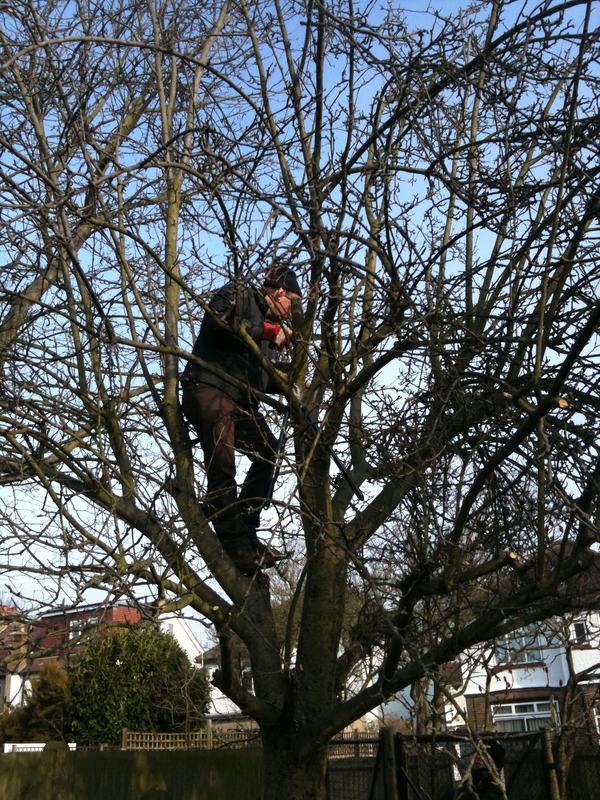 We braved the freezing cold on Saturday 4th February to be part of a pruning workshop at our lovely little Orchard at Walmer Gardens. The London Orchard Project are doing a fantastic job helping us and brought in an expert to guide us through the day. With some dedicated volunteers and support – including Jon Skoyles, Ealing Park Ranger, this Orchard has undergone a complete transformation. It will take a couple more years of pruning, planting and caring for the place but we know it will be worth bringing this place back to life. Next up is the beehive Ealing Transition will be setting up around April – I’ll let you know exact dates when confirmed should anyone be interested in coming along. Here are some pictures of the day (click to enlarge).